The 3 disciplines follow on from each other (speed – boulder – lead). The classification is determined by multiplying the positions obtained by the climbers in each discipline. Saint-Etienne is constantly changing, it has been driven by the links between design and industry for more than two centuries. The city uses design as a catalyst of creative potentials of everyone. Since 2010, Saint-Etienne has belonged to a world wide network of 16 cities enjoying the label « Ville Créative Design » awarded by UNESCO. The artficial climbing wall of the new Jean Gachet gymnasium opened in November 2016 fits in this procedure linking design and innovation. 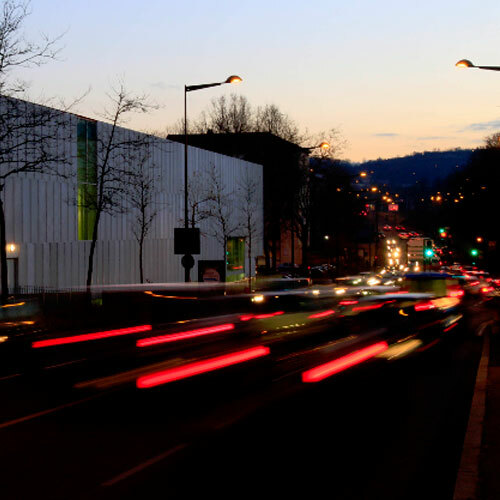 Planned by the company ESCATECH with the partnership of the Comité territorial FFME de la Loire, the 15 meters high and 52 meters large structure (872 m2) offers a hundred roads (10 000 holds) of all possible standards, a double speed road (IFSC certified) and a front wall of blocks which is integrated to the lead wall. To this day, this climbing wall is the first and the only one to allow the Olympic Combined speed – boulder - lead on the same equipment. This creation has been carried out with a financial help from the FFME. Shuttle Ouibus (bus) just outside airport > Saint-Etienne Chateaucreux station > tramway (to Bellevue - stop Jean Jaurès) > 5 mn walk. Or Tram > Lyon Part-Dieu station > Train TER Saint-Etienne Chateaucreux station > tramway (to Bellevue – get off at Jean Jaurès) > 5 mn walk. TGV direct Paris - Saint-Etienne-Chateaucreux station > tramway (to Bellevue – get off at Jean Jaurès) > 5 mn walk. Saint Etienne centre ville (rue de la Montat > Chateaucreux station > rue Louis Souillie > Boulevard Jules Janin > Boulevard Alfred de Musset. Exit : Saint-Etienne centre ville > Rue Bergson > boulevard urbain > Boulevard Alfred de Musset.